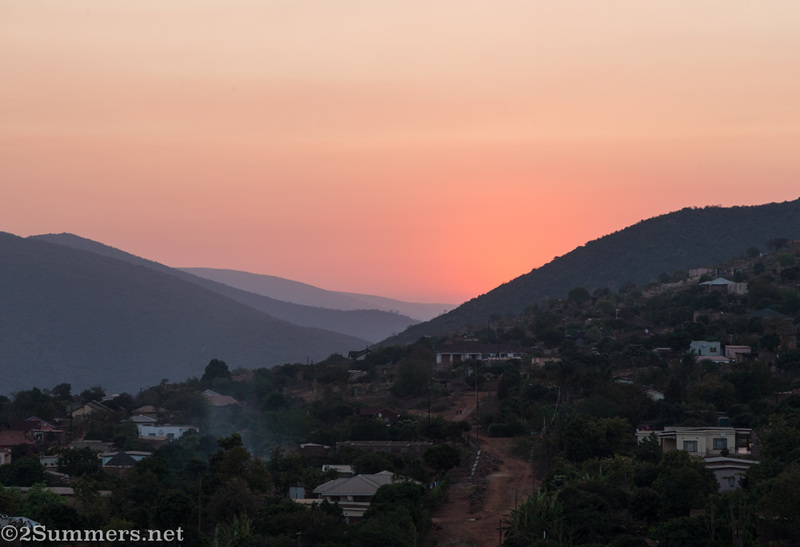 I recently participated in a weekend trip to Magoebaskloof with a bunch of Instagrammers. It was a typical trip for me, in many ways: fun, social-media-oriented, filled with non-stop action, and planned by someone else. I loved it, and I’ll have lots more to say about that weekend in a future post. But instead of going home at the end of the weekend, as I normally would, I stayed behind for another week and practiced a different kind of travel. I drove all over Limpopo, exploring corners of the province that are far from conventional tourism routes, following my own agenda rather than someone else’s. Venda was my final destination. My friend Lucky is from Venda. It’s a former Bantustan in the northeastern tip of South Africa. (Bantustans were separate “countries” the South African apartheid government set up in the mid-20th century as a way of keeping black people in poverty, essentially enslaved, and separating them from the ruling minority whites.) 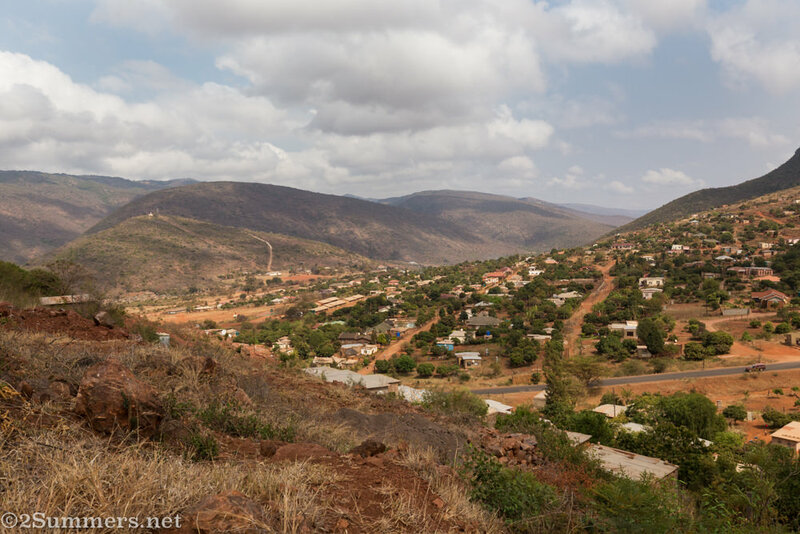 Venda borders Zimbabwe, and the Venda language is more similar to Shona (one of Zimbabwe’s dominant languages) than it is to any of South Africa’s other ten official languages. 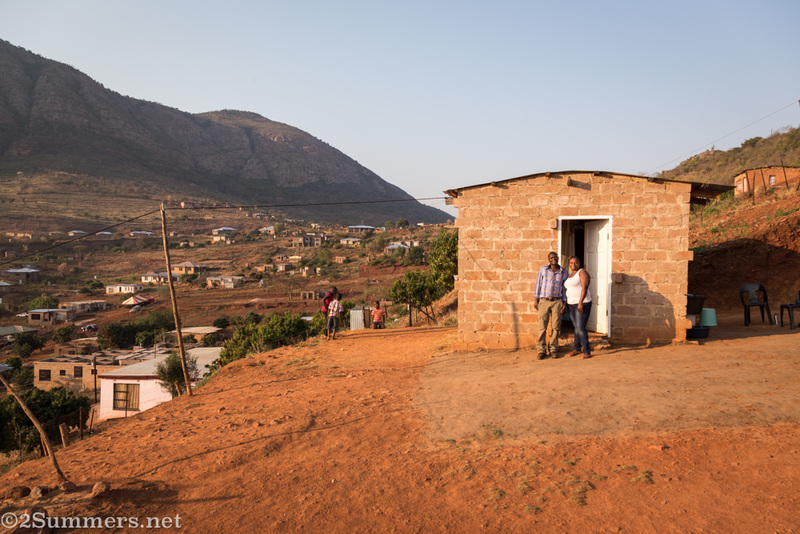 I’ve been wanting to visit Lucky’s family in Venda for years, and last weekend we finally made it happen. 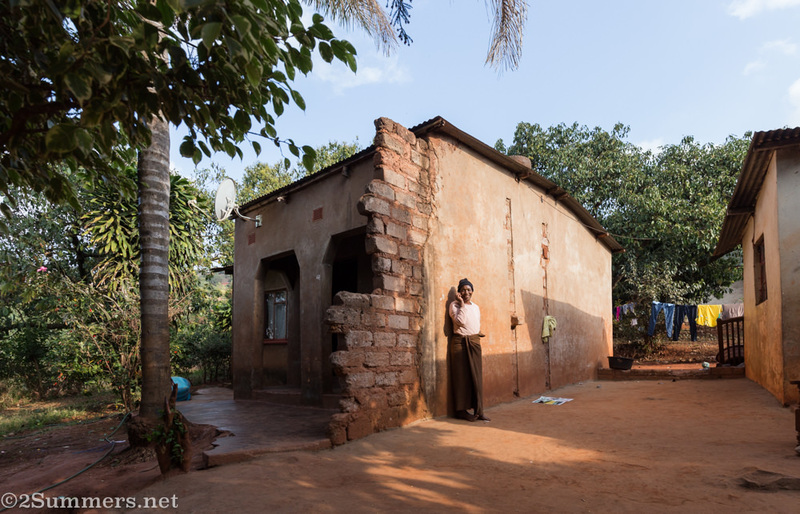 Lucky’s mother, Anna, talks on the phone outside Lucky’s childhood home in Murunwa, Venda. After an amazing experience exploring Limpopo’s Ribola Art Route, which I’ll write about in a future post, I met Lucky at a petrol station in the town of Makhado (formerly Louis Trichard). We did some shopping, I had my punctured front tire patched (rural Limpopo’s roads are not to be taken lightly), and we picked up Lucky’s younger brother, Mpho. 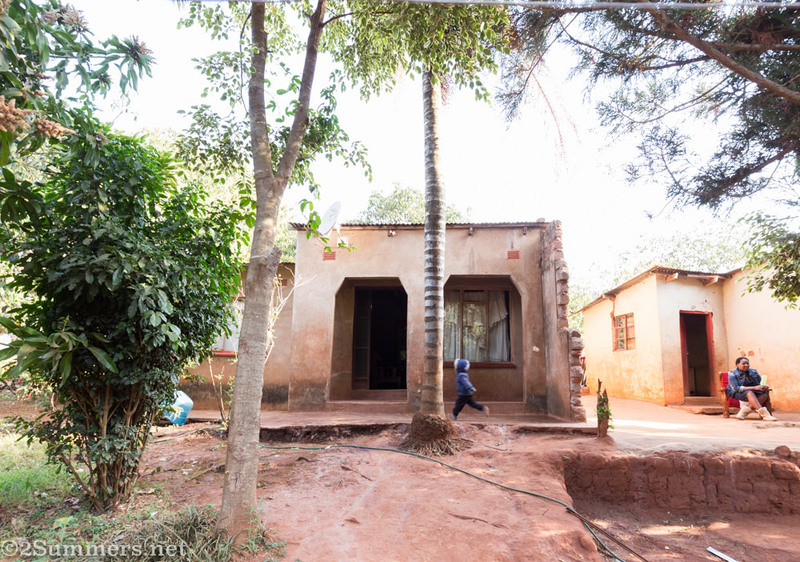 Then we drove 30 minutes to Lucky’s parents’ house in Murunwa, Lucky’s home village. The house Lucky grew up in. I was most excited to meet Lucky’s parents, Johannes and Anna. 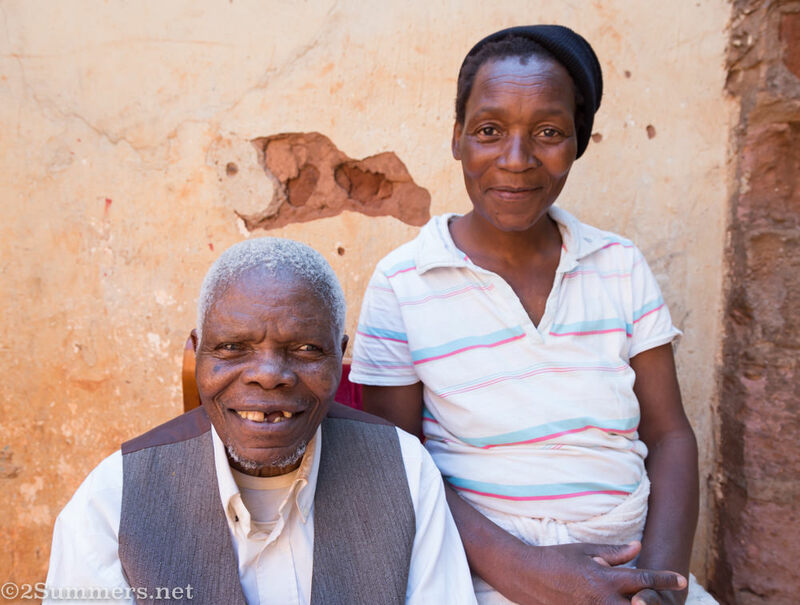 Johannes, who is in his late 80s and blind, is a legendary figure in the family. (Read more about Johannes in a previous post I wrote about Lucky’s life.) On both of the days that I met him, Johannes was wearing a suit. 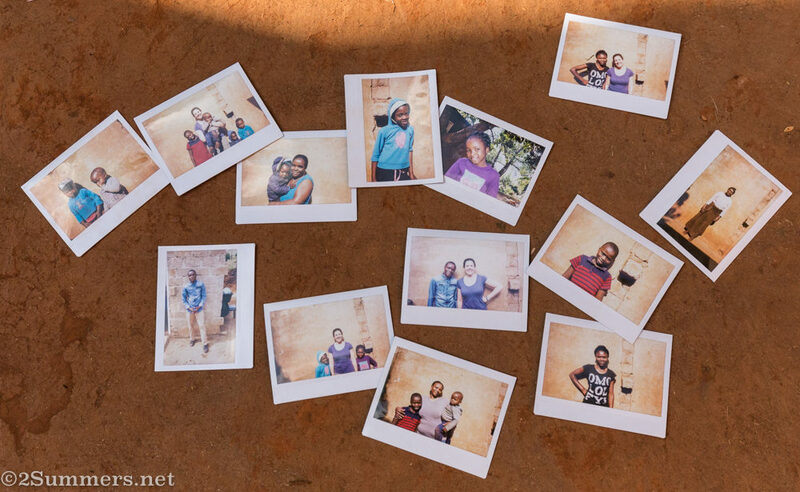 Anna holds an Instax portrait of several members of the family: left-to-right are Lucky, Lucky’s sister-in-law Alfina and his nephew Tendi, Johannes and Anna, Lucky’s uncle Edward, his brother Mpho, and his nephew Andani. 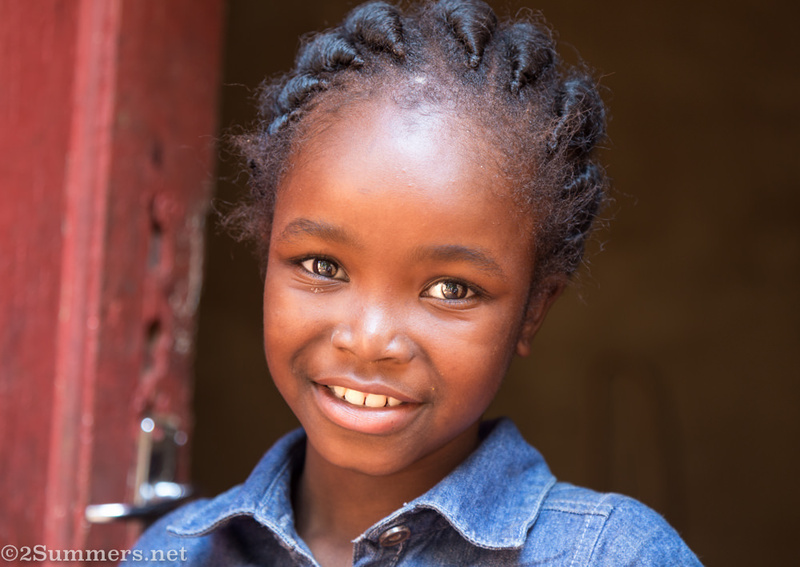 Lucky’s incredibly photogenic niece, eight-year-old Shudu. 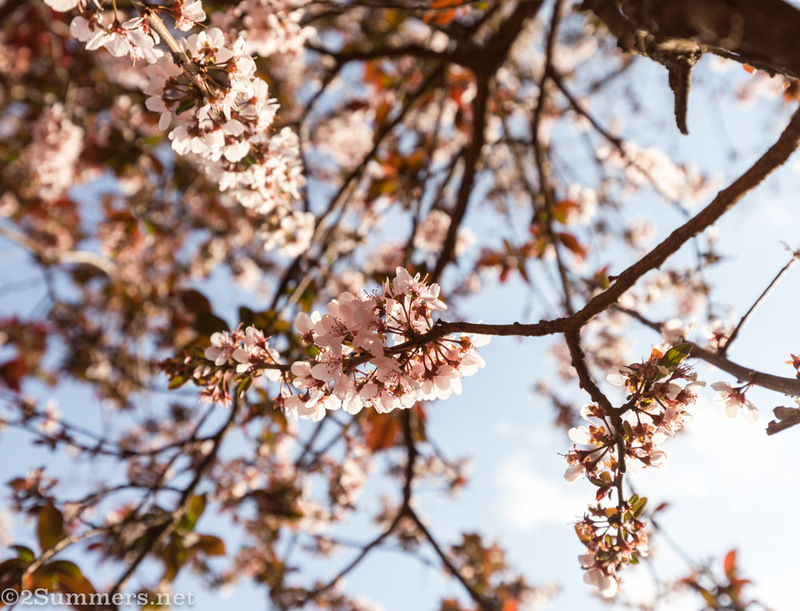 A plum tree blooming in the yard. 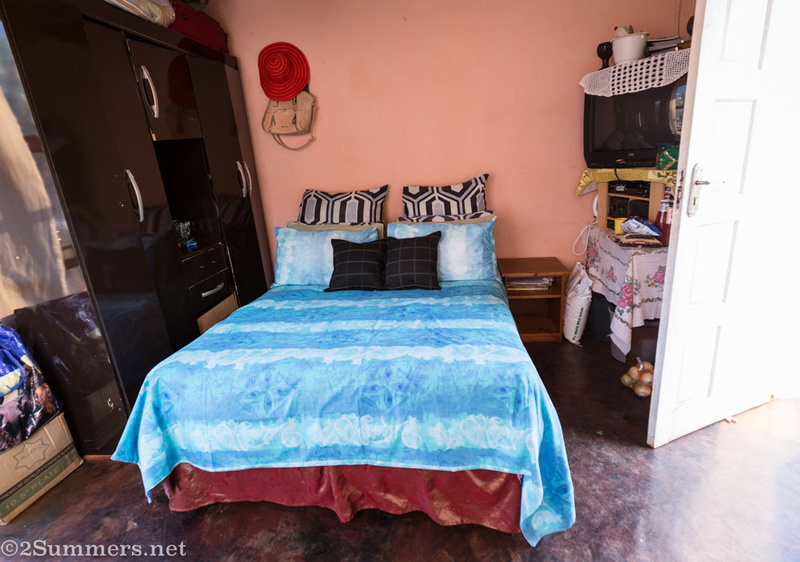 After an hour or so in Murunwa we went on to Lucky’s new house, just up the road in Phadzima, where Lucky lives with his wife and two sons when he’s not working in Joburg. Lucky finished building this one-room house about a year ago. The house is near the top of a steep hill, and all the materials for building the house were carried up a narrow dirt path that left me short of breath each time I climbed it. 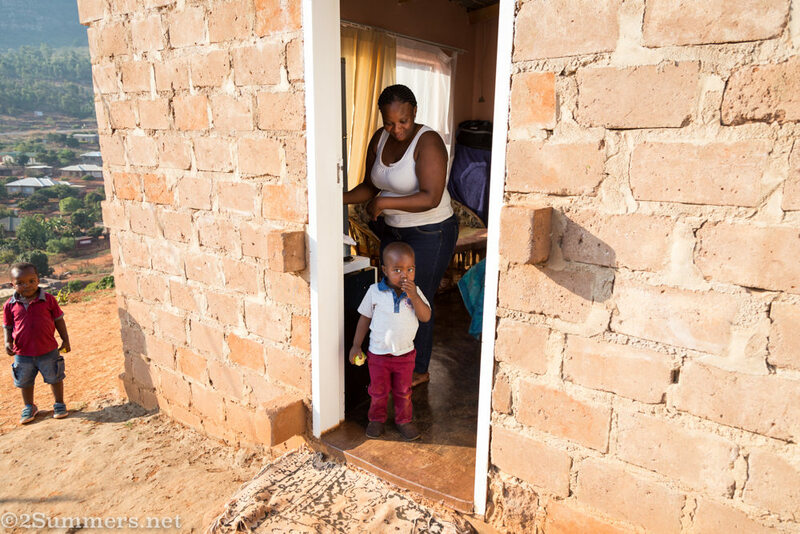 The house doesn’t have running water; Lucky’s wife, Vhutshilo, carries all of the household’s water in buckets up that narrow dirt path. See the top row of houses on the hill? Lucky’s house is the second from left. If you look down below it, on the dirt road, you’ll see a tiny silver car — my car — which is parked at the bottom of the narrow path. Lucky and Vhutshilo in front of their house. Vhutshilo and her younger son, two-year-old Adi. Cousin Tendi is on the left. Adi, like his cousin Shudu, is exceptionally photogenic. 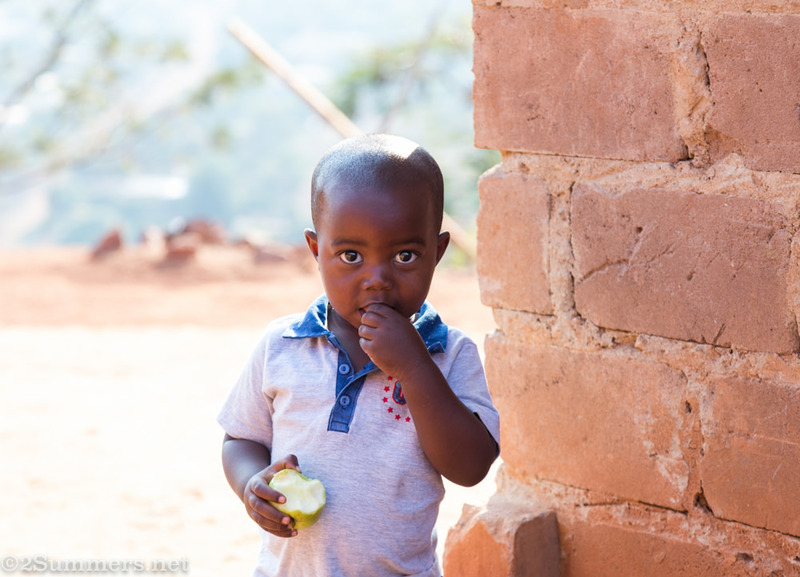 Lucky’s older son, 10-year-old Rudzani, somehow managed to evade my camera all weekend. I loved Lucky’s house from the moment we arrived. I loved the view of the surrounding mountains. I loved the intimacy of the single room, which magically contains everything one could need. (Although my western, white-privileged brain could not conceive how four people can live there together. I mentioned this to Lucky during the drive back to Joburg; he laughed and said it’s not a problem at all.) I loved the sounds. I loved the smooth, polished cement floor and the neatly swept yard, made of dried cow dung. I guess Lucky could see how much I loved his house. When I brought up the idea of sleeping at a B&B, as we sat over a meal of chicken stew, mango atchar, and sour pap, Lucky insisted that I would stay at his house for the weekend. He and Vhutshilo would take the kids and stay with his parents. I protested, briefly, but then agreed. Allowing me to stay alone at his house was the best gift Lucky could have given me. Sitting on a plastic chair in the yard at dusk, just after Lucky left with his family, listening to the sounds of the village and drinking pink wine from a water glass. Tugging open the corrugated iron door to the privy at the bottom of the yard, struggling to close it again once I was inside, and trying to act like long-drop toilets are the most normal thing in the world to me. Washing my face and hands in a small plastic bowl, becoming acutely aware of how much water I waste on a daily basis. Waking up at dawn to find the mountain surrounded by mist, listening to gospel songs wafting up from a funeral tent below. Funerals last all night in Venda. Sharing my trail mix with the neighborhood kids, who wandered over and couldn’t figure out what I was doing alone in their friend Rudzani’s house. 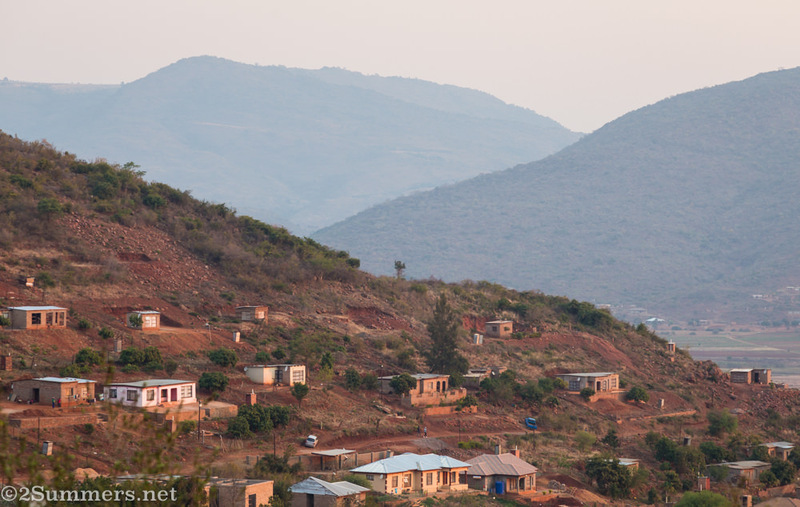 Catching a minibus taxi from Murunwa to Phadzima, just before sunset. Several wide-eyed teenagers approached me at the side of the road (I think it’s pretty rare to see a white woman waiting for a taxi in Murunwa) and told me how happy they were to meet me. One of them hugged me. When I flagged down a taxi and got in, the kids ran behind the van, waving and laughing. Waking up on the last morning, exhausted and emotionally drained, and texting my mom. “I was just thinking how nice it would have been if you were here with me visiting Lucky’s family,” I typed. And then I burst into tears. Walking down the steep, narrow path for the last time and getting into my car with Lucky, who was driving back to Joburg with me. 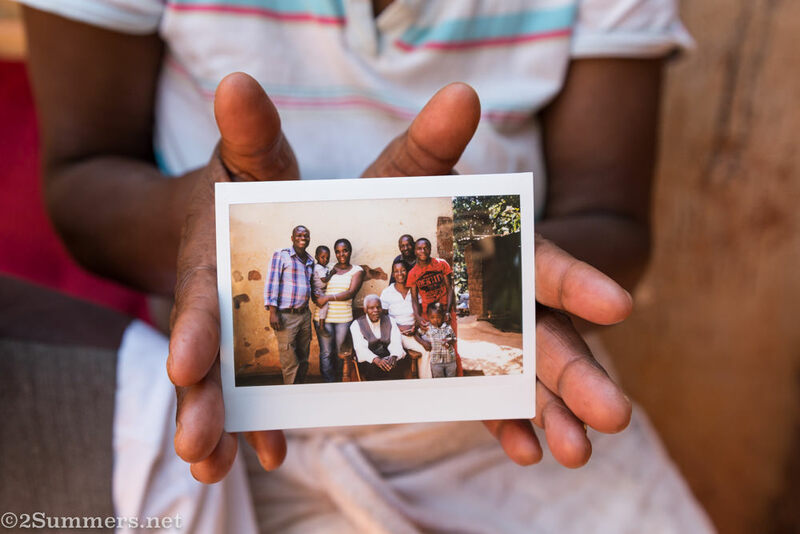 Vhutshilo held Adi, who clutched the Instax photo I’d taken of his father. When Adi realized Lucky was leaving with me, his little face crumpled and he began to cry. A few of the Instax photos I took over the weekend. There were many more. That was my weekend in Venda. I don’t have any more words to describe it. I’ll be back. Lekker post Heather, I feel you – there’s no more genuine hospitality and kindness than in some of our deeply rural areas. It really is, and it definitely feels different from any other place I’ve been in SA. Gorgeous photos and post and yes, I forgive you for making me cry with your lines about your mother and Adi’s tears. Haha, I appreciate that. Thanks. Hmm, I don’t know! I definitely got called Mlungu a couple of times, which is a Zulu word for white person. This made me cry, because I miss my country with a passion that only someone who has been there and known her people will understand. I loved your story about Lucky’s family and staying in his home, thank you for sharing. Thanks so much, Lindi. Thanks for reading and I’m so glad you’re enjoying the blog. My b/f told me when he visited one of his students in rural China how shocked he was that the floor of their home was dirt. Packed dirt, but nonetheless, dirt. Life without running water is really hard. I guess I should have known that already. What a lovely experience for you. Thank you for sharing your friend, Lucky, his beautiful family and your insights. Very instructive on many levels! Thanks so much, Katherine. Glad you enjoyed it.